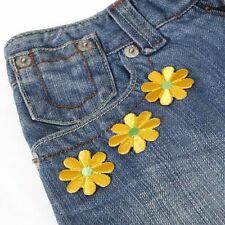 5 Iron on daisy flowers. Quick dispatch! 5 x Pink Iridescent Rainbow Unicorn Patches with Defects Defects : Scorch marks to edges from cutting out of design, iron on backing poorly cut out and loose threads (see pictures) You will receive the exact patches as shown in the picture. Iridescent Rainbow Unicorn - Size Approx : 8.3cm x 9.6cm Uses: Attaching to bags, blankets, jeans, jackets, tops or many other craft projects. Please see my ebay store Clearance category for many more bargain deals on iron on motifs. 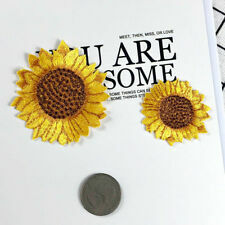 9 x Daisy Flower Iron / Sew On Enbroidered Motif Patch with DEFECTS Defects : Loose threads, incomplete stitching, off centre design, some marks on stitching, iron on backing poorly cut, patch poorly cut out etc. You will receive the exact patches as shown in the picture. Size approx : 5.3cm x 5.3cm Colours - see picture. Uses: Attaching to bags, blankets, jeans, jackets, tops or many other craft projects. 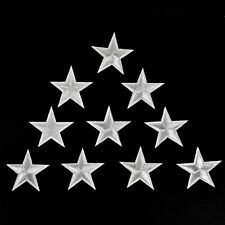 Please see my ebay store Clearance category for many more bargain deals on iron on motifs. Cut out each character and iron on. 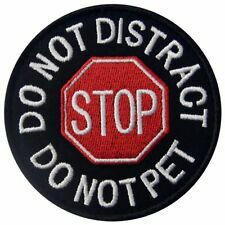 CAN BE IRONED ON OR SEWN ON. 2 X PATCH SETS. 2 Purple iron on lotus flowers. 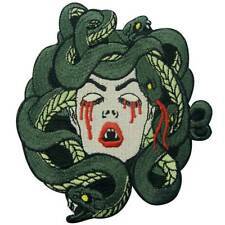 CAN BE IRONED ON OR SEWN ON. PLACE A TEA TOWELL OVER THE PATCH BEFORE IRONING. 2 X PATCH SETS. BEAUTIFUL COLOURS. 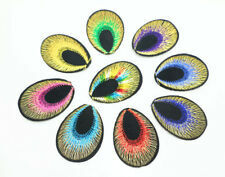 12x Butterfly Sequin Iron / Sew On Embroidered Motif Badge Patch with DEFECTS You will receive the exact patches as shown in the picture. Defects : incomplete embroidery, missing sequins, minor scorch marks from cutting out - see picture Size : approx 7.5cm x 5.4cm Uses: Attaching to Jackets, Jeans, Tops, Bags, Fancy Dress and many other Craft Projects Please see my ebay store Clearance category for many more bargain deals on iron on motifs. 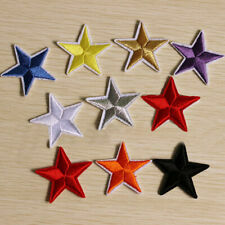 But star patches have a wide variety of uses. Martial arts schools and youth football (soccer) clubs, for example, use them for encouraging regular attendance, rewarding hard work or as a reward for mastering particular skills. 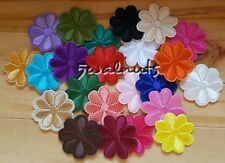 4x Rainbow Butterfly Iron / Sew On Embroidered Motif Badge Patch with DEFECTS You will receive the exact patches as shown in the picture. Defects : incomplete embroidery, fabric doubled up on one patch (top left corner), poorly aligned design, poor quality stitching in places and missing embroidery on some edges Size : approx 9.3cm x 8cm Uses: Attaching to Jackets, Jeans, Tops, Bags, Fancy Dress and many other Craft Projects Please see my ebay store Clearance category for many more bargain deals on iron on motifs. 2pcs Green ron on daisy flowers. 5 x Hot Pink Sequin Bow Embroidered Iron On Sew On Motif Patches - Clearance You will receive the exact patches as shown in the picture. 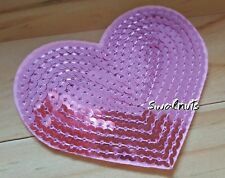 Size Approx : 6.7 cm x 6.2cm Uses: Attaching to bags, blankets, jeans, jackets, tops or many other craft projects. Please see my ebay store Clearance category for many more bargain deals on iron on motifs. 5x White Leaping Pink Rainbow Unicorn Iron/Sew On Embroidered Patch CLEARANCE You will receive the exact patches as shown in the picture. 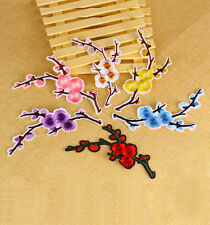 Size Approx : 7.2cm x 3.7cm Uses: Attaching to bags, blankets, jeans, jackets, tops or many other craft projects. Please see my ebay store Clearance category for many more bargain deals on iron on motifs. 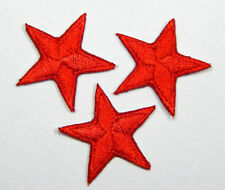 Brown embroidered star patches applique. 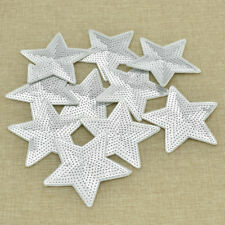 But star patches have a wide variety of uses. Martial arts schools and youth football (soccer) clubs, for example, use them for encouraging regular attendance, rewarding hard work or as a reward for mastering particular skills. 5x Mini Distressed Denim Jean Heart Iron / Sew On Embroidered Motif CLEARANCE Size Approx : 4.3cm x 4cm Uses: Attaching to bags, blankets, jeans, jackets, tops, covering holes/marks on clothing or many other craft projects. Please see my ebay store Clearance category for many more bargain deals on iron on motifs. 5x Butterfly Iron / Sew On Embroidered Motif Badge Patch with DEFECTS You will receive the exact patches as shown in the picture. Defects : incomplete embroidery, poorly aligned design and poor quality stitching/different coloured stitching Size : 7.5cm x 5.9cm Uses: Attaching to Jackets, Jeans, Tops, Bags, Fancy Dress and many other Craft Projects Please see my ebay store Clearance category for many more bargain deals on iron on motifs. 5 x Brown Teddy Bear Face Iron / Sew On Enbroidered Motif Patch with DEFECTS You will receive the exact patches as shown in the picture. Defects : incomplete embroidery and poor quality stitching Size : approx 4.2cm x 3.5cm Uses: Attaching to Jackets, Jeans, Tops, Bags, Fancy Dress and many other Craft Projects Please see my ebay store Clearance category for many more bargain deals on iron on motifs. CAN BE IRONED ON OR SEWN ON. PLACE A TEA TOWEL OVER THE PATCH BEFORE IRONING. 2 X PATCH SETS. CAN BE IRONED ON OR SEWN ON. 3 X PATCH SETS.